An induction cooktop is an alternative to more traditional gas or electric cooktops. They use electromagnetic energy rather than using heating elements or burners. The manufacturers claim that they are more efficient and safer than traditional gas and electric cooking options (Source). You may be wondering “How does induction cooking work?” Well, it’s a very unique and innovative concept. An induction cooktop works by utilizing electromagnetic energy to heat the pot or pan itself rather than just creating heat that transfers to the pot or pan from underneath (Source). With induction cooking, the cooktop itself remains cool to the touch. 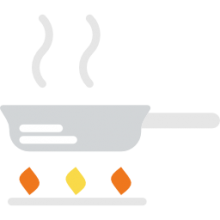 Buyers mention the importance of having the right cookware for induction cooktops to work with induction cooking (Source). Not all cookware is compatible with an induction cooktop. To see if your cookware is cookware for induction cooktops, check to see if a magnet will stick to the bottom of it. If the magnet sticks, your cookware will work with an induction cooktop. One buyer suggests that if you’re using a nonstick pan, to start your induction cooktop at a lower temperature before turning it all the way up so that your cookware heats a little slower. This will help preserve the nonstick coating on your cookware. All induction cooktops use the same technology, but each has a different set of specific features. 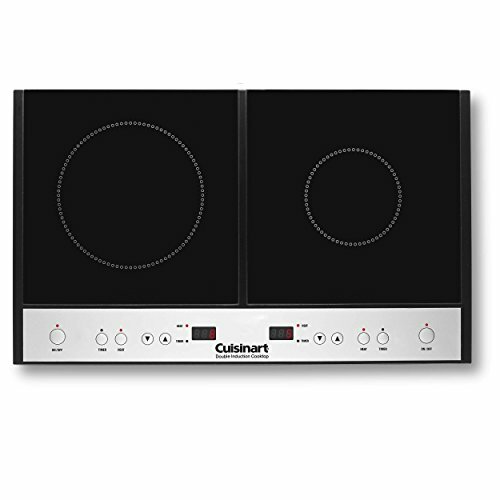 For example, the Cuisinart induction cooktop is one of the best induction cooktops if you are cooking multiple things because it has 2 independently working sides. The other four induction cooktops on the list accommodate one pan at a time. The Rosewill induction cooktop has 8 temperature settings with a max temperature of 450 degrees Fahrenheit, while the Secura induction cooktop has 10 different temperature settings with a maximum temperature of 460 degrees Fahrenheit and the Duxtop has 20 temperature settings going up to 460 degrees Fahrenheit. The NuWave has only 6 pre-programmed settings for temperature, but can be manually set to 52 different temperatures going all the way up to an impressive 575 degrees Fahrenheit. Finally, the Cuisinart actually has different temperature options for each of its 2 sides. One of its sides has 5 different settings while the other side has 8 settings. The Secura, NuWave, Cuisinart, and Duxtop induction cooktops all have an auto-off feature that will automatically turn the induction cooktop off shortly after a piece of cookware for induction cooktops is removed so that you can’t accidentally leave it on if you’re not using it. The Duxtop induction cooktop also has a child safety lock feature. The Secura1800W Induction Cooktop is a solid option if you are looking for a fast, safe-to-use and easy-to-clean cooktop. Users like the efficiency of this cooktop, but do complain about getting an error code all the time. This product features a digital control panel, a built-in count-down digital timer with 1 min increments up to 170 minutes, 10-temperature range from 140 Degree Fahrenheit to 460 Degree Fahrenheit and 10 power levels from 200-1800W. It is lightweight and compact for easy handling and storage. This item seems like a solid choice if you want a cooktop that detects the size of the cookware base and automatically adjusts for minimum wasted energy. The general user consensus concerning the Secura Counter top Burner is that it is very durable and easy to clean. Users agree that it allows for efficient cooking and also add that the water boils very fast. However, many buyers complain about getting the error code “E0” regardless of the type of cookware they use. Some complain about too much noise that the device makes. The Rosewill Induction Cooktop is a solid option if you want to cook with the power of a magnetic field. Users like the quality of this burner, but do complain about certain malfunctions. This product features a large LED screen display, three-hour timer, beautiful polished crystal plate surface, 1800W and heat from 150 up to 450 Degree in 8 increments. This item could be a solid choice if you want an energy-efficient cooktop that saves you time, money and energy use. 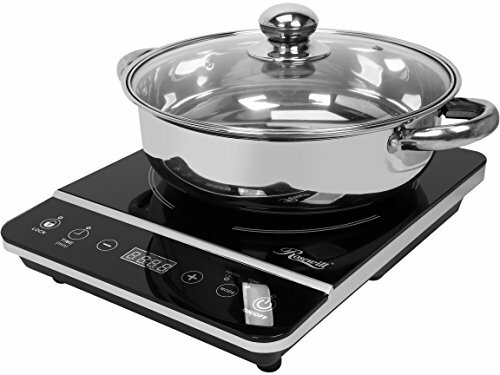 In general, users have a favorable opinion of the Rosewill Cooktop with Stainless Steel Pot.They agree that the stove is powerful, fast, efficient and easy to clean. However, some buyers complain about the cooktop malfunctioning upon only several uses. One buyer complains about the poor quality pot that comes with the burner. If you are looking for a versatile induction cooktop, you might want to consider this one offered by NuWave PIC. Users love the convenience of this kitchen appliance, but do complain about a wiring issue. This product offers precise temperature control, adjustable in 10-degree increments. It features state-of-the art programming technology with 100 hours of memory that allows you to prepare complex recipes with ease. The NuWawe Uses cooktop uses up to 70% less energy than conventional gas or electric ranges, plus, its lightweight and portable. This induction cooktop might be a solid choice if you want one that allows you to cook at 52 different temperatures between 100°F and 575°F. 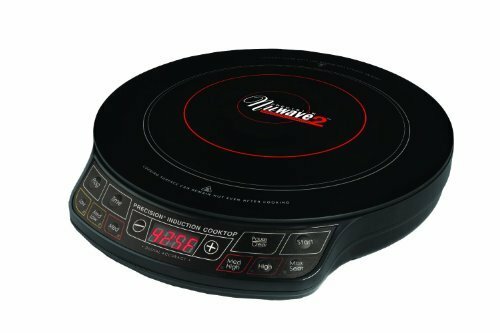 In general, users have a favorable opinion of the NuWave PIC Precision Induction Cooktop and they agree that it is of great quality and very convenient. They find cooking on it fast and easy. However,some purchasers complain about defective wiring which causes it to not respond at times. Another complaint regards the fact that it stop heating in the middle of the cooking. 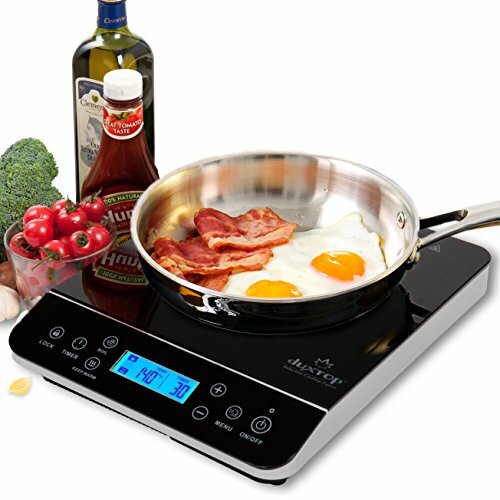 If you are looking for a top-rated induction cooktop, you might want to consider the Duxtop LCD Induction Cooktop. Users love the functionality of this cooktop, but do complain about the noise and temperature control. This product automatically adjusts the generated magnetic field to the size of the cookware base. It features a digital LCD sensor-touch control panel, child safety lock system, “fast boil” button and “keep warm” button. This item could be a good choice if you are looking for a stylish centerpiece on the table for outdoor parties or in the kitchen as an extra cooking zone. In general, buyers are pleased with the Duxtop 18000W Portable Countertop Burner. They appreciate its good quality, solid built and power. What they like in particular is quick heating. However, some buyers complain about the loud noise it makes. One purchaser shares that the top is very slick and pans thus tend to move easily. Several buyers say that the temperature control doesn’t work properly. The Cuisinart Double Induction Cooktop is a solid option if you are looking to bring more cooking flexibility to your kitchen with two induction burners. Users love the performances of this appliance, but some do complain about receiving a defective item. This product provides instant heat-up and consistent, precise heat throughout cooking.There are two individual 150-minute timers, heat setting controls and On/Off switches for each burner. If you are looking for a versatile and powerful double induction cooktop, this might be a solid option. In general, users are happy with the Cuisinart ICT-60 Induction Cooktop. They like that it heats very fast, as well as the fact that it is easy to clean, small and compact. Users conclude that it is a perfect cooktop for a small space. However, some buyers complain about receiving a defective item. Several purchasers state that their cooktops stopped working after a few uses. To dive deeper into our analysis of the best induction cooktop, we're going to isolate our two favorites and take a more forensic examination of their qualities. The Secura is marketed as a portable option that utilizes 120 V along with 15 amp of electricity- marketed as an especially compact and lightweight option for storage and handling purposes. Since this cooktop measures 10.5" x 10.5" with an 8-inch diameter circle for the burner, buyers say that if you have a 12-inch pot it will actually extend over the control panel. Another reviewer we spoke with told us that he has ended up using it for all of his searing, sautéing, and pan-frying purposes. He also applauds how incredibly fast it will boil water. He does say that since you have to use iron-based cookware for this style of cooker to work some of his stainless steel pots didn't function with it at all. Another interesting claim, the manufacturers say that it is a great conversation piece- meaning for entertainment purposes it is an attractive and stylish centerpiece for a festive dinner party indoors or outdoors. Another reviewer explains to us that after his gas stove top failed he purchased this portable induction cooktop countertop burner as a temporary solution as he pondered which brand he would replace his old broken gas stove with. He was pleasantly surprised at how quickly became hot weather he was boiling water for pasta, frying chicken, or working with a wok. On the downside, he says the bad it's not ideal for scrambling eggs because it will overcook or burn them- this is the case with anything that requires light to medium heat. An additional benefit is when you have a lot of guests over for Thanksgiving or Christmas, the countertop induction solution provides an extra burger to prepare food in a jiffy. The second place option we examined was the Duxtop portable induction cooktop burner. One buyer we spoke with says that it has a clean user interface and more diverse low-temperature capabilities than comparable options on the market. On the downside, another buyer complains to us that is it emits a high pitch noise when it is configured at its highest setting. One other issue we saw is that the temperatures spike up and down, with one buyer saying or that they would range from 100 all the way to 145 in the span of 25 minutes that he kept track. This means it would not be ideal if you are trying to maintain a consistent temperature for the purposes of melting something delicate like white chocolate. Another reviewer we interviewed told us that he purchased it because he likes making his own yogurt at home and since this has lower temperature capabilities it was the option he went with. It took a fair degree of experimentation before this yogurt maker discovered the best temperature range to work in and the best pot to use to make his yogurt.